In the Beginning Was the Image, painted in the open air in 1965, dates from arguably the most crucial period of Asger Jorn's life and career. For it was only during the early 1960s that Jorn truly began to formulate his thoughts and philosophical beliefs, writing book after book, and to incorporate his beliefs into his art. The painting is packed with life and color. The viewer can vaguely discern the features of various characters in the chaotic maelstrom of paints. Prompted by the scale and title, one is even tempted to see a religious scene playing itself out. Here Jorn's belief in the importance of aesthetic creation is played out to an epic scale. Jorn's vivacious painting is in fact a product of his own philosophical beliefs. As an expert practitioner of Pataphysics, the scienceless science inspired by one of the works of the great proto-Surrealist Alfred Jarry, Jorn's philosophical beliefs were deliberately muddled. According to Pataphysics, every theory, scientific or other, was merely a belief as valid as any other. While the Surrealists and their heirs took on this obtuse notion largely for fun, Jorn saw in it the potential foundation of a format for all his beliefs. The necessary chaos implied by Pataphysics perfectly corresponded with his various, often conflicting, theories. In the Beginning Was the Image, the viewer is faced with an image of the Pataphysical world taken seriously. The chaotic mesh of barely distinguishable shapes means that the viewer can be completely flummoxed by the almost--appearing faces and forms within the work. No one interpretation is correct--that would destroy the entire point of the work--and yet some of the faces seem almost unambiguous. Each face and recognizable feature in this work was deliberately marred by Jorn before it had the chance to take on a truly visible form-he was himself the architect of this painting's colossal opacity, manoeuvring the viewer into a corner of incomprehension and hence wonder. The epic nature of Jorn's investigation and celebration of art and creation is reflected both in the scale and the title of the work. Indeed, In the Beginning Was the Image is the largest and most important ever Jorn painting to come to auction. It is a truly imposing work, and appears dictatorial and didactic in its overwhelming scale. Likewise, its title takes one of the most familiar lines of the Bible ('In the beginning was the Word') and inserts one small but infinitely important change. Jorn has chosen an iconic phrase and changed it, shocking the viewer into taking notice. 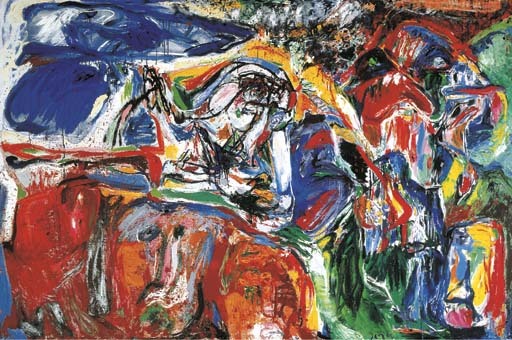 Jorn himself claimed that his titles were mere tags to distinguish the one from the other: 'I use the titles in a very slapdash way, and at the same time making sure not to be too precise, not to give a painting too precise and unambiguous a meaning' (Jorn, quoted in Peter Shield, Comparative Vandalism: Asger Jorn and the artistic attitude to life, Aldershot, 1998, p. 67). This is in fact very misleading, as during this period of reflection and formulation of his philosophical views Jorn was using his titles to complement his works and, despite his belief in Pataphysics, to guide the viewer's interpretation to some extent. With its Biblical tone, there is something of the preacher about the title In the Beginning Was the Image. This seems to some extent a reaction to Jorn's background. He was the son of two Christian teachers, and indeed his father was an extreme fundamentalist. The title can thus both be seen as a snub to his doctrinal upbringing and a subversive adoption of their language and didacticism to serve his own ends. Jorn always retained a strong interest in the mystical, and religion doubtless fell into this bracket. However, an even stronger guide in his work was his intense investigation of the mythical, of the long heritage of the Nordic peoples. Jorn's own work, in his mind, was merely the latest development in a long history of folk art and heritage. Although the images he produced were not folk art, as a Dane he felt that his interpretations of his heritage was in its own right valid and, indeed, necessary. He even believed that Scandinavians were uniquely adapted to seek and depict the true emotional core of existence: 'In no place in the world do aestheticians go to the depths in madness and poverty so often and so compulsively as here. We are brought up in it' (Jorn, quoted in Shield, op.cit., 1998, p. 150). While the 1960s were a period of great advances in his philosophy, they were also the years in which his mastery of color truly came to the fore. He had always hoped to somehow imbue each individual color with an autonomous, almost mystical strength, and it was during this period that he finally began to achieve them. In In the Beginning Was the Image, his early interest in Kandinsky has surpassed his schooling with Fernand Léger, and his spontaneous, quasi-abstract expressionism is bolstered by the glistening reds and lapis blues. However, it is the love of color, not of form, that Jorn derived from Kandinsky. His interest in spontaneity, in being free from ideas and preconceptions when he first laid paint on the canvas, are wholly detached from Kandinsky. The patterns and forms that Jorn painted were dictated only by his own reaction to what had gone before, each brushstroke a reaction to the organically growing whole. This in itself adds to the autonomy of each color--Jorn himself intuitively found the way forward each time his brush hit the canvas. Usually, he would begin at the top right and work his way down. In In the Beginning Was the Image, the dark and speckled top right appears to bear this out, as the rest of the canvas lacks the same density, especially the more open and uncluttered left-hand areas. Slowly, his own marks led him to create and dissolve monstrous visages at will, each application of color dictating itself and the next. This painting thus documents the actual act of artistic creation--the birth of its own image. Fig. 1 Willem de Kooning, Woman, Sag Harbor, 1964, oil on panel, Hirshhorn Museum and Sculpture Garden, Smithsonian Institution, Washington D.C.